Hollywood icon John Cusack makes his way to the Knoxville Civic Auditorium for a live conversation and audience Q&A on Friday, June 21. 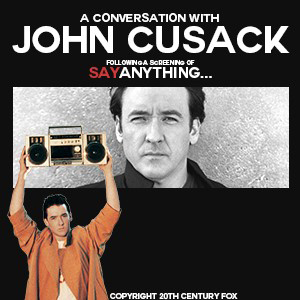 Following a screening of the iconic 1989 film Say Anything, John Cusack will give a behind-the-scenes look into his breakout role as Lloyd Dobler; share stories from his career spanning four decades and roles in more than 70 films; and answer audience questions. Ranked by Entertainment Weekly as one of the greatest modern movie romances (and #11 on the list of 50 best high-school movies), Say Anything made a star out of John Cusack who went on to success in multiple films including High Fidelity, Grosse Point Blank and Being John Malkovich, among others. Now fans will have the unique and rare opportunity to experience a moderated conversation with John answering audience questions. A limited number of VIP seats will be available, which include a post-show photo op with John. Tickets can be purchased at the Knoxville Civic Auditorium and Coliseum box office, online at Ticketmaster.com or by phone at 1-800-745-3000. The Knoxville Civic Auditorium and Coliseum, an SMG managed facility, is conveniently located near the junction of Interstates 75 and 40 and sits downtown near the University of Tennessee campus. The facility attracts more than 250,000 people per year through a wide array of events, including Knoxville Ice Bears hockey games and the Knoxville Symphony Orchestra Pops Series. The facility includes a 6,500-capacity coliseum with 22,000-square-feet of exhibit space; 2,500-capacity auditorium; 10,000-square-foot exhibit hall; 4,800-square-foot ballroom; and a natural lawn amphitheater with a capacity of 8,000. Founded in 1977, SMG provides management services to 243 public assembly facilities including convention and exhibition centers, arenas, stadiums, theaters, performing arts centers, equestrian facilities, science centers and a variety of other venues. With facilities across the globe, SMG manages more than 19 million square feet of exhibition space and more than 1.5 million sports and entertainment seats. As the recognized global industry leader, SMG provides venue management, sales, marketing, event booking and programming, construction and design consulting, and pre-opening services for such landmark facilities as McCormick Place & Soldier Field in Chicago, Moscone Convention Center in San Francisco, Houston’s NRG Park and the Mercedes-Benz Superdome in New Orleans. SMG also offers food and beverage operations through its concessions and catering companies, currently serving more than 140 accounts worldwide. For more information, visit www.smgworld.com.